As a fall intern for the Midwest Food Connection, this week I had the opportunity to visit two different schools during their lessons. It was such a joy to see the organization and students in action! Last Tuesday morning, I visited Seward Montessori in Minneapolis. One of the MFC’s educators, Kristi, worked with first, second, and third graders. First, students reviewed examples of roots, seed holders, and leaves. It was exciting to see how many students were able to contribute great examples from each category! 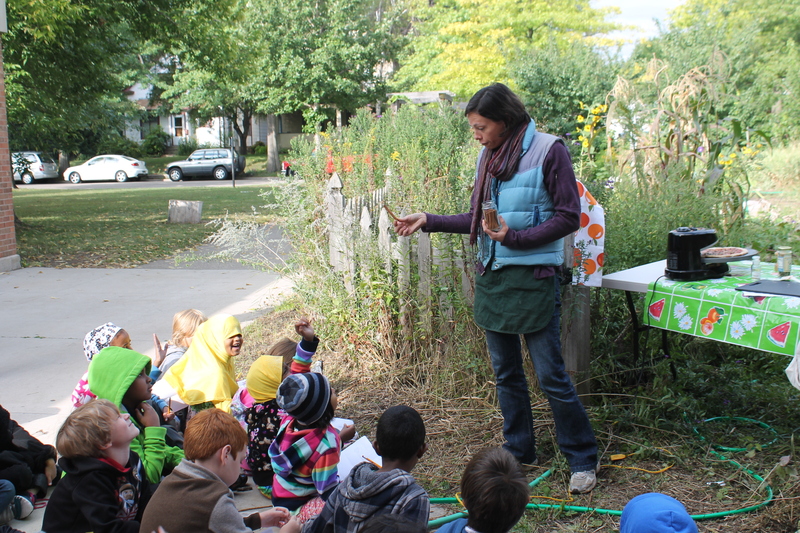 Kristi informed the students that this particular day would be focused on leaves and specifically, herbs. “Herbs are leaves,” after all! After some more instruction, the eager students shuffled out of the classroom and into the crisp, early-autumn air. Once in their bountiful garden, they were challenged to draw and label four different herbs. They also had a chance to taste two herbs: mint and chives. It was nice to hear how many students were familiar with the herbs and how willing they were to taste the ones they were less familiar with. Meanwhile, Kristi had set up a pizza-making station in the corner of the garden and students took turns watching the preparation of a pizza made with the herbs growing in their school’s garden.When the drawings were complete, a game was in order! Kristi led students through an edition session of an MFC original game show, “Herb or Spice?” Here, their knowledge was tested and they proved to be excellent contestants. The students were well-deserving of the pizza they enjoyed at the end of the lesson. Such hard workers at Seward! Last Thursday, I spent some time in a third and fourth grade classroom at Clara Barton Open School in Minneapolis. Haruko also led a discussion on the differences between roots, leaves, and seed holders. 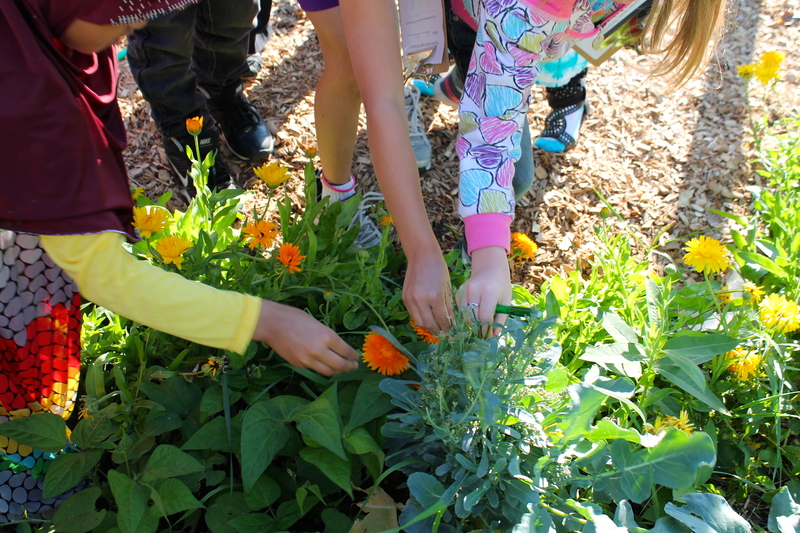 With all of this new knowledge, students got into groups and headed out to their garden, where they would be tasting and harvesting some vegetables. I loved seeing how willing the students were to taste food they weren’t familiar with! They tasted the beets, carrots, and rainbow chard they harvested. You can imagine the delight and surprise students felt when their smiles were suddenly turned pink from the vibrant juices of the beets!